If you have a newborn baby, you may notice that they sleep a lot. An average baby will sleep for at least 16 hours a day. Hence, it is critical to invest in a baby bassinet to keep them comfortable and provide a cozy place for them to sleep in. Whether you are a new mom or just looking for a great gift to expectant mothers, we’ve listed the best baby bassinets that you can find on the market today. Here are the following top 10 best baby bassinets that you should consider buying. This baby bassinet from Halo is on top of our list but is one of the most expensive models. It features a 360-degree rotation. In that way, you can bring your baby close to you anytime you want. The side walls can be lowered, making it easier for you to place your baby. After that, to ensure their safety, you can lock the walls in an upright position. Compared to other baby bassinets available in the market today, its 360-degree rotation feature is quite handy for placing your baby in and out without difficulty. Due to its handy features, this baby bassinet is ideal for mothers who are recovering from C-sections. It’s made of a sturdy and four-point base that you can adjust to your bed. The base can be easily tucked under the bed and does not consume much space. The package includes a nightlight and two levels of vibration. There are three soothing sounds and three lullabies to ensure a good night’s sleep to your little one. Next, we have the co-sleeper baby bassinet from Arm’s Reach. This elegant-looking bassinet has beautiful curved wooden ends. It also features a good amount of mesh to ensure great air circulation for your baby inside. This handy feature also allows you to have increased visibility, especially if you have the habit of turning off the lights when you sleep. Aside from that, compared to other bassinets, so far it is the only model that features divided storage below. This allows you to place your baby’s diapers, toys, and clothes. Now you can sleep with your baby within arm’s reach and ensure that he or she is comfortable with his or her bed. This baby bassinet is both stylish and functional. It does not consume much space making it ideal for mothers who have limited space in their bedroom. The SNOO smart sleeper is made of 100% organic cotton for your baby’s optimal comfort. Now you don’t exhaust yourself and the baby when going to sleep thanks to this product. It can also send your little one to sleep faster because of its soothing white noise and gentle motion that all babies love. It is far by one of the safest baby bassinets we have found in the market so far. What we like about this product is its utilization of smart technology. The SNOO boosts to keep the same rhythm again and again to calm the babies. It also detects crying of your young one which automatically makes the bassinet rock gently. The hip-safe design and mesh panels can prevent your baby from getting uncomfortable with too much heat. It’s not wobbly even if it provides a soothing motion in an entirely flat swing. 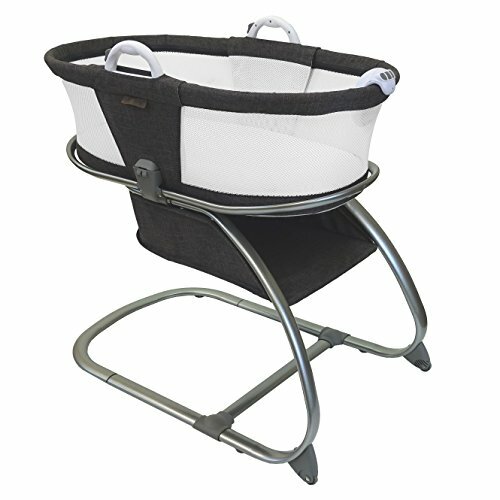 Check out the Baby Planet convertible bassinet. This contemporary-styled bassinet features soothing lullabies, nature sounds, and gentle rocking motion with muted check light for a muted illumination. You can turn the bassinet 360-degree, making it easier for you to sleep with your baby next to you. 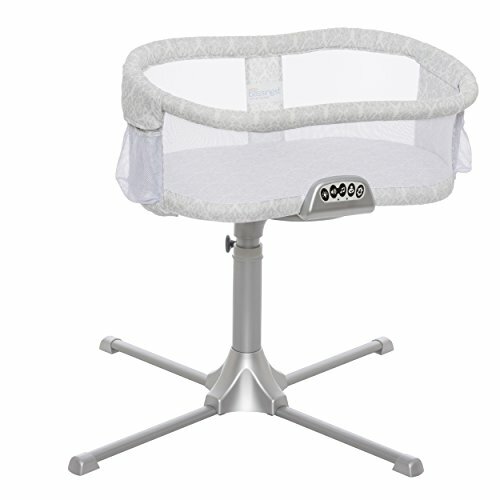 It also features a breathable Airloft interior mesh to keep the air circulating inside the bassinet. Thanks to its rolling base and quick-release handle, you can transfer this bassinet anywhere you want. What we like about this product is its efficacy for years to come. Since it’s a convertible bassinet, once your baby has outgrown this bassinet, you can turn it into a storage pod. Or you can use it for your other babies. With its solid construction, rest assured that it can last for a long time with proper care and maintenance. 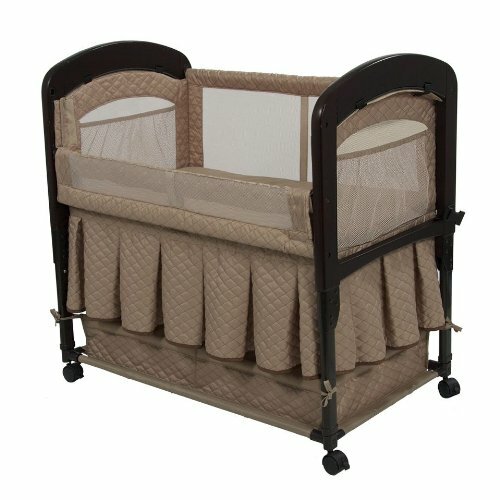 If you liked the bassinet with storage that we’ve featured above, you might want to check this product. This is from Arm’s Reach manufacturer, a baby bassinet that is made of 100% polyester. The imported bassinet is an ideal choice for mothers who are still recovering from C-sections. It has a built-in leg extension that makes it easier for you to adjust the height. It’s also a safer alternative to bed sharing when your baby is prone to be run over by you. It has four caster wheels that allow you to move the baby bassinet around. The mesh interior also allows excellent air circulation and prevent your baby from getting uncomfortable by too much heat. We also like how its innovative design makes breastfeeding easier for first-time mothers. Looking for a sturdier baby bassinet? Check out the Ninna Nanna bassinet. This espresso-colored bassinet is handcrafted using the finest quality materials. It also features soft yet protective sides for your young one, covered with micro-suede. It is safe to wash in a washing machine once it gets dirty. The product also features a waterproof mattress, making it easier for you to clean it. There are two fitted 100% cotton mattress sheets included as well. 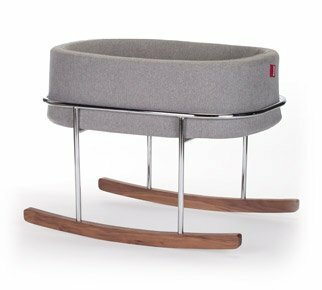 This solid birch rocker base will eradicate the wobbly bassinet problem, keeping your baby safe and sound at all times. Even if it does not have any storage space underneath, once your baby has outgrown the product, you can use it as a display area for all the toys and gifts that you have received for your young one during the baby shower. 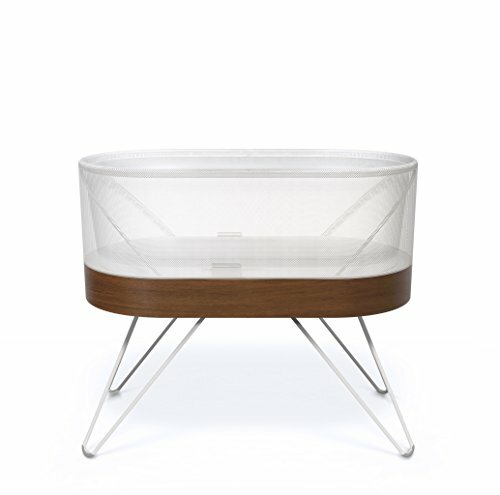 For mothers who are looking for a modern-styled bassinet, check out this product from Monte. It features a waterproof mattress and includes two fitted 100% cotton sheets. Rest assured that this product is free of any flame retardant chemicals. The sides are both soft and protective. You can remove the covers from the side once it gets dirty for washing. This impressively handcrafted bassinet is both stylish and elegant. Once your baby stirs at night and moves around, the bassinet will movie, making the baby rocks themselves to sleep. Also, the minimalistic design of the product complements any modern living room or bedroom elegantly. 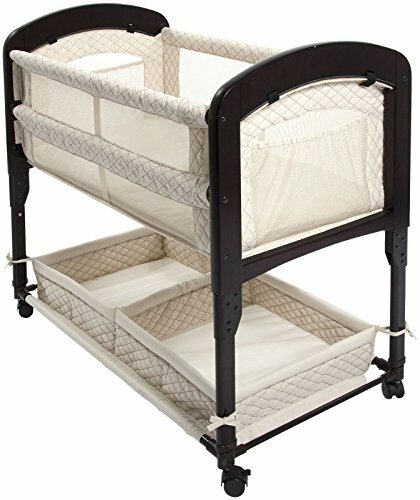 If you want a bassinet that looks like a crib, you have found what you are looking for. 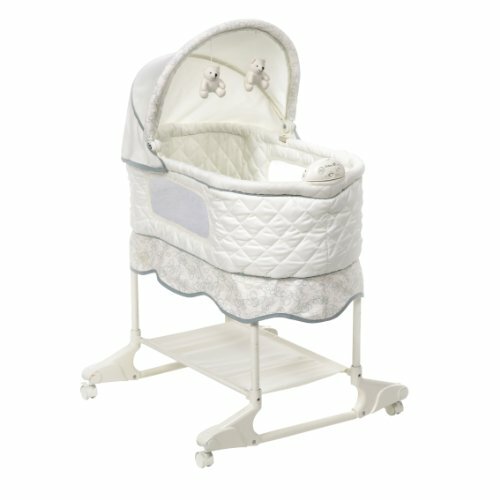 The Safety First Nod-a-Way Bassinet in white is the perfect solution to send your baby to sleep in no time. It features a storage shelf underneath your baby’s toys, diapers, and other things. The soft and cozy fabric is perfect for any infant, and it also includes adorable soft plush toys. You can easily retract the canopy to mute the light for your young one. The caster wheels are designed for easy mobility, allowing you to transfer the bassinet from your bedroom to living room if you want to keep an eye on your child. The sheets are also removable and washable to keep his place clean and comfy. Next, we have the Baby Home air bassinet. This modern-looking bassinet comes with an attachable changing pad that makes it a practical choice. There are easy-to-reach side pockets and mesh windows to keep your baby comfortable. You can interchange the leg position in three different modes: the wheels, rocker, and stationary mode. Notice the magnet at the top and the bottom to open and close the window as you want quickly. The fabric is removable and is safe to wash in a washing machine. 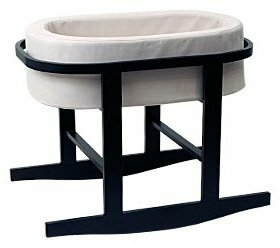 This contemporary baby bassinet is ideal for children aging 0 to six months. Now you can ensure that your baby will have a good night’s sleep and long naps in the morning. Lastly, we have the Dream bassinet in grey. 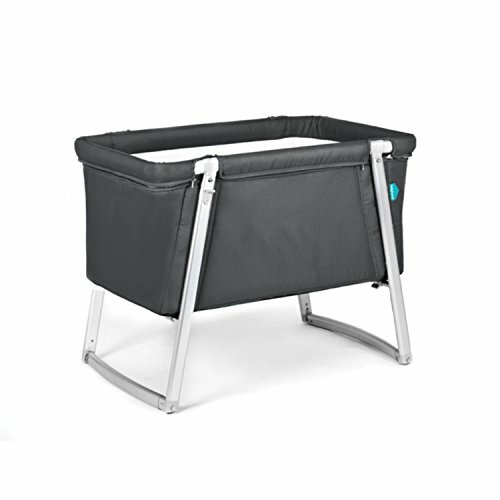 This modern bassinet is an outstanding travel cot that features an adjustable leg system. Its grey color and modern design look great in any contemporary house. Now you can send your baby to sleep with peace of mind that he or she is safe and secure inside. Also, you can interchange the leg system to rock mode when your baby falls asleep at night. When he or she wakes up and stirs, the baby will most likely start moving. As a result, the bassinet rocks gently and they can send themselves back to sleep without disturbing you at all. It’s easy to clean and maintain. The sheets are washable, and it’s easy to put up. If you are expecting a baby soon, buying a baby bassinet can help you sleep better at night, knowing that they are just by your side. Some parents buy baby bassinets when the baby has arrived, and sometimes end up buying a bassinet with issues. To help you avoid the same mistake, here is a buying guide for baby bassinets as well as the top-selling baby bassinets in the market. Why Invest in a Baby Bassinet? Compared to traditional baby cribs, baby bassinets are lightweight and portable. You can easily place it inside your room, especially the experts suggest that you sleep with your baby for the first six months to establish a close relationship. 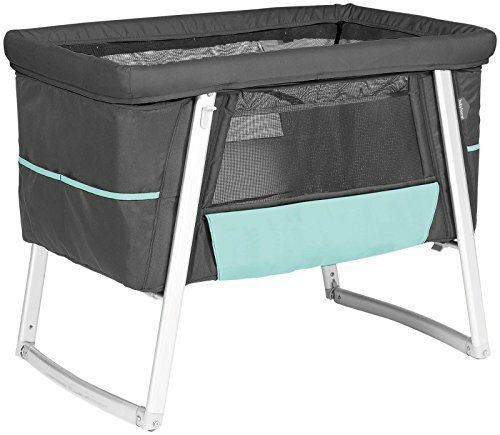 You can easily carry the baby bassinet in your room, living room, and can be even placed outdoors when you don’t want to leave your baby inside the house. Despite its small size, a baby bassinet can provide optimal comfort to your child when sleeping. Most models may come with pillows, blankets, and comfortable bed sheets for your baby. You may also use it as his personal bed if you want to assure the safety of your child since baby bassinets will enclose your kid inside to prevent accidental fall. When not in use, you can fold your baby bassinet and store it in your cabinet. Most of the bed sheets and blankets are removable, allowing you to wash and maintain it clean easily. A baby bassinet with a durable, solid frame is bound to last for a long time. It also ensures the safety of your baby when he’s sleeping on it. The durability of the material also affects the stability of the bassinet. The more durable it is, the less it’s likely to topple over. To give you peace of mind, it is crucial that you also take a look at the safety standards imposed by the manufacturer to their bassinets. For starters, you should look for ASTM or JPMA labels. This ensures that the bassinet has passed the safety standards, the materials are safe to use, and it does not cause suffocation to your child. Check if the bed sheets are removable and are easy to washed. You might want to keep your baby’s bed clean to avoid infection. Also, consider the materials used for the baby bassinet. It is best to buy a bassinet with a cleanable surface that can resist stains and impurities. Another thing that you should consider is the capacity of the baby bassinet. Most models can accommodate babies weighing up to 20 pounds. You may also check the recommended age of the child for the use of the bassinet before you buy it. Some manufacturers will even give you advice on when you should discontinue using the product. You should also consider if you want to buy a rocking or stationary bassinets. While rocking bassinets are nice, because you can easily lull your child to sleep, stationary bassinets are safer to use. Rocking bassinets may be dangerous once your child starts to move a lot. He may accidentally topple over the bassinet once he starts kicking and rolling. Most of the bassinets may come with wheels, allowing you to move the bassinet from one place to another. Some can even be folded when not in use. In that way, you can quickly bring your baby bassinet wherever you go. Portable bassinets may come in handy especially if you’re bringing your baby with you when you travel to other places. Lastly, you should pay attention to the toys and other accessories that may come with the bassinet. As much as possible, do not buy bassinets with small, hazardous toys that may accidentally choke your kid. Opt for bassinets with soft, plush toys that cannot harm your children because most kids have the habit of putting everything inside their mouth. It is best to choose a bassinet with hanging toys; in that way, your baby can’t reach into it and harm himself.